In November 2019 Grant and Helena Atkinson will lead a private group of photographers to two of Botswana’s greatest wildlife areas. The safari includes five nights in the Selinda private concession and three nights on the Chobe River based on a houseboat. This trip is limited to 6 photographers only, and will have two photographic trip leaders, Grant and Helena. We will have two vehicles for our group game drive activities. Selinda is a truly wild and rugged part of northern Botswana, and regularly gives us strong sightings of lion, elephant, leopard, African wild dog, spotted hyaena, giraffe and lots more. Being in a private concession means that there are only a handful of other game drive vehicles around, and the experience is intimate. We can also go off-road when we need to get closer. The Chobe River is famous for its abundant elephant herds, as well as hippo, crocodiles and many colourful and interesting bird species. We make use of a specially designed photographic boat for our excursions, that puts us at a low angle for a strong perspective, and can also go in shallow water, allowing us to make some close approaches to our subjects. These are some of Botswana’s top destinations when it comes to wildlife safaris and we are running this trip during what is arguably Botswana’s best game-viewing season. The latter half of September and all of October is northern Botswana’s dry season and much of the wildlife, particularly elephants, gather along the permanent waterways. All images in the gallery are from recent safaris to these destinations. This trip is run by Eyes On Africa. We have partnered with Eyes On Africa on this safari. Our group size is a minimum of 3 participants and a maximum of 6 participants and this is one of our most popular trips. If this exciting safari sounds good and you are thinking of joining this trip, please get in touch with any questions you may have. Eight days on safari in some of our favourite areas in Botswana. We welcome photographers with all levels of experience. This safari will be conducive to learning from one another and include instruction that will suit everyone’s photographic needs. We focus on photographing in the field. We spend most of our time and effort on photographic activities and getting images. Non-photographer or videographer spouses / travel companions will also have fun on this safari. The wildlife places we visit will appeal to anyone with a love for animals and nature. The photo leaders are experienced naturalists with rich backgrounds in conservation and field guiding and the region’s natural history and wildlife. A maximum of 3 photographers per vehicle, means that there will be plenty of space to have your gear at the ready, and the opportunity to access both sides of the vehicle. We have modified Toyota Landcruiser safari vehicles, with three rows of seats within, and completely open on the sides to minimize obstructions to photography. Adjustable lens support brackets/platform to assist with the use of heavy telephoto lenses, on one side of each vehicle, depending on availability and exact vehicle specification. Two photographic leaders, Grant and Helena Atkinson will lead the group. The group size is limited to 6 participants and we will make use of 2 vehicles. The photographic leaders will switch between the vehicles. With 2 photo leaders and only 6 participants we focus on individual attention. This itinerary focuses on up-close and real wildlife experiences from the surroundings of our comfortable accommodations. This safari includes five days in the Selinda Concession and three days exploring the Chobe River on a houseboat. There will be the opportunity to benefit from the leader’s wealth of experience in this region as Grant and Helena lived and worked in this area for many years. These are some of Botswana’s top destinations when it comes to wildlife safaris and we are running this trip during what is arguably Botswana’s best game-viewing season. We focus our safari around the two perennial rivers, the Selinda Spillway and the Chobe, to take maximum advantage of dry-season wildlife concentrations. This safari represents a fantastic combination of superb wildlife photography experiences, comfortable accommodation and expert guiding. As always, we will spend lots of time out in the field, and you will be with like-minded photographers who are happy to put in the time to get the images. We will be staying in classic safari tented camps and for some parts of the safari, we will have the ability to go off-road (not in environmentally sensitive areas) in order to get the best photographic angles of our subjects. All images in the gallery are from recent safaris to these destinations. Guests are to make their own way to Kasane, Botswana for the start of this safari. After arriving in Kasane and collecting luggage, you will be met by Grant and Helena. We will be transferred by road (15 minutes) to the jetty for pick-up by the Pangolin Voyager houseboat – our base for the next 3 days. We will also exit Botswana and check-into Namibia, via immigration offices beside the river itself. The Pangolin Voyager is a very comfortable way to explore the The Chobe River, famous for its wildlife. The lower deck features five en-suite cabins, with air-conditioning, that can be configured as either double or twin berths. The lounge and dining areas are located on the middle deck. This area can be opened on three sides, affording panoramic views for watching game. The large dining table is the center-point for our daily meals as well as editing sessions. The open-air top deck offers sun loungers, chairs and tables, ideal for viewing the river surroundings. By choosing the Pangolin Voyager as our base, we are able to avoid the busiest parts of this popular waterway. The Voyager will moor each night right on the northern bank of the river, allowing us to enjoy the views and solitude of the river long after most other day-visitors have had to depart the park. For our game viewing, we will make use of specially-designed photographic boats that have swivel seats and configurable camera and lens mounts that are completely state of the art. Aside from providing superbly stable and responsive mounts, the boats’ shallow draught will also enable us to access shallow water easily and to make near-silent, drifting approaches to our subjects. The Chobe River during the dry season is one of the most incredible places in Africa to get up close to wildlife. During the months of August-October the Chobe River becomes a vital water source for large numbers of elephant, buffalo, waterbuck, kudu, impala and warthog. The Chobe River is also one of the best places to photograph hippos and crocodiles. Waterbirds abound and add an entirely new chapter to our photographic opportunities, as do some of the raptors that occur in the area. Most bird species are more approachable on the Chobe than anywhere else, making for high-quality photographic opportunities. Moreover, by basing ourselves right on the river, we are able to be on the water at sunrise and sunset, maximizing our photographic opportunities. The Chobe is well-known as one of ‘the’ places to go when trying to take great photographs of elephants at or in water, as well as up-close hippo and crocodiles. When it comes to special birds, the Chobe always delivers. Our safari is timed to coincide with the breeding cycles of several species, including the rare African skimmer. Each year a handful of these striking birds attempt to raise their chicks on some of the river’s exposed sandbanks. Some of the other birds that abound in the area are African fish-eagle, African marsh harrier, giant, pied and malachite kingfisher, yellow-billed storks and white-fronted and carmine bee-eaters. On the morning of the 14th, we will take a scheduled safari flight (with extra luggage allowance for camera gear inclusive) to the Selinda concession (approximate 50 minutes). On arrival at Selinda airstrip, we will be met and transferred on a 45 minutes drive to the camp. Selinda Explorer Camp is a small, wonderful tented safari camp that is situated on the banks of the eastern Selinda Spillway – a waterway that links Botswana’s Okavango Delta to the Linyanti and Kwando marshes, rivers and floodplains. The camp accommodates a maximum of 8 people. Our group will have the use of private driver-guides and vehicles throughout our 5-day stay at Selinda Explorers Camp and we will set our own hours and schedule to allow us to take full advantage of photographic opportunities. We have chosen to stay at Selinda Explorers for a variety of reasons. Perhaps the foremost of these is the wide variety of wildlife for which this region is known. Lions roam this area and have done so for a long time. We might expect to come across them in any of the different habitats that make up this diverse concession. Leopards also occur here and favour the ribbons of riverine forest that line the waterways, but they can be found almost anywhere. 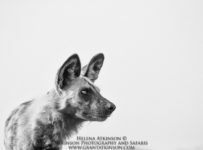 Aside from these two charismatic cats, Selinda also provides ideal habitat for African wild dogs and over the last seven years or so, the wild dogs have denned with success here. Spotted hyena is also present and adds still more to the variety on offer. The Selinda Channel is a semi-permanent water source that connects the waters of the Okavango River to the northern waterways of the Selinda, Savuti and Linyanti. Our camp is located right on the banks of this important waterway. The Selinda also provides a constant source of replenishment for the herds of elephant and buffalo that frequent its floodplains, woodlands and islands. Other game animals that we might encounter include hippo, giraffe, and a mix of interesting antelope species, like impala, kudu, waterbuck, red lechwe and very rarely, sable antelope. The mix of different habitats also makes for good birding. In addition to the wide variety of animals that we may encounter, staying at Selinda Explorer camp also means that we will be able to venture off-road in order to improve our vehicle positioning for photography. On the 18th, after our last morning game drive, we will catch a scheduled safari flight to Maun for our flights home. Air travel and customized extensions to this safari, including Johannesburg, Cape Town, Victoria Falls and other destinations may be arranged through Eyes on Africa as desired. Ask us for further information. This trip will run with a minimum of 3 participants and a maximum of 6 participants. Our group size is a maximum of 6 participants. Note also that some of the safari camps will only accept cash for private purchases. There is not likely to be wi-fi or internet connection at Selinda Explorer Camp nor on the Chobe houseboat. There is cellular phone network along the Chobe River from local Namibian networks. At Selinda Explorer Camp charging of batteries and electronic appliances can only be done in the main area. On the Chobe houseboat, we are able to charge in every room as well as the main area.